Campaign manager Nick Kouvalis was up until 1 AM firing off nearly 80 consecutive tweets defending his candidate's draconian proposal to screen immigrants for "anti-Canadian values." If you notice any barbaric cultural practices or anti-Canadian activities on your way to the corner store, Conservative leadership candidate Kellie Leitch’s campaign manager has a few ideas about who to blame. But until now, Leitch has had trouble explaining why she’s so paranoid about an immigration system that her own party was in charge of running for the last decade. And by the way, who was immigration minister for most of that decade? Oh yeah, it was Jason Kenney. What fueled Kouvalis’ late night Twitter essay? The name of the book is Points of Entry: How Canada’s Immigration Officers Decide Who Get In, written by McMaster sociology professor Vic Satzewich. Satzewich told iPolitics he thinks Leitch’s anti-Canadian values test is a “terrible idea” and doesn’t agree with any of her conclusions about his book. So Kouvalis decided to dispute the author’s interpretation of his own book. 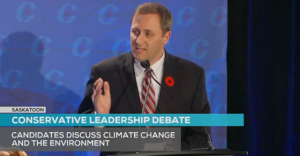 But while Kouvalis was doing that, he let something slip about former immigration minister Kenney. The original context of the passage cited above actually relates to dubious statements Kenney made in his 2013 farewell letter as citizenship and immigration minister. He said he found no evidence, however, that they’re regularly making bad or risky decisions. “As a result of doing the research, I have a lot more confidence in the immigration system and seeing how visa officers work. They’re actually very conscientious. They’re concerned about applying the law correctly and being balanced in their decision-making,” he said. “Every year, visa officers process 1.3, 1.4 million visa applications. Can you imagine doing interviews with 1.3 or 1.4 million applicants? It’s going to bring the immigration system to a grinding halt,” he said. 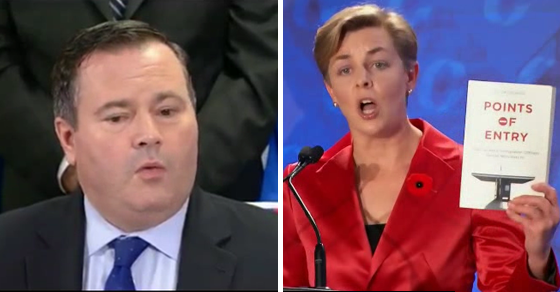 For his part, Kenney has condemned Leitch’s proposal and suggested her interest in immigration issues is not sincere. “I don’t take her position seriously,” Kenney told the Globe and Mail in September. Already several candidates and interim Conservative leader Rona Ambrose have denounced Leitch’s proposal, with one candidate suggesting her proposal poses a threat to social conservatives – Leitch herself would not rule out banning Catholics either. And there are further signs that Leitch’s descent into xenophobia is opening wide divisions in the Conservative party base. Fellow Conservative leadership candidate Deepak Obhrai recently reported his office was flooded by racist emails this week telling him to leave Canada after he publicly opposed Leitch’s values test. "I don't think man-made greenhouse gases are a problem on the environment."